Well…the leaves are changing colours, reading week has come to an end and finals are quickly approaching. As we as students are slowly jumping over the midterm bump we prepare ourselves for the most crucial time of a student’s world: finals. For professors, final exams are a way to assess the material we have learned from the course as a whole. For students, we try to cram in every detail we have heard during lecture and hope for the best. 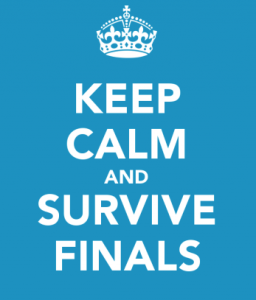 As finals approach, it is important for everyone to maintain a stress-free environment. Students should remember that getting proper sleep and eating healthy foods could make a world of difference when finals arrive. Your brain needs to be nourished so it can absorb the information you are giving it. It is also important that people are aware of their exam schedules and if they are unclear about anything on the exam that you can always ask your professor- that’s what they are there for! The most important advice I have for students going into finals is to relax. A single test is not going to make or break how you will do in the grand scheme of your degree. You have to remember that you got to where you are now by doing what you are doing. Study and do your best and it will be good enough. Don’t tell yourself it’s too hard and don’t ever give up. 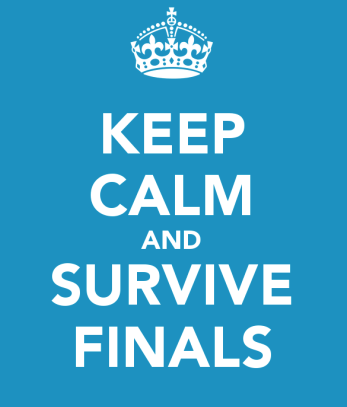 Every student on campus is going to finals as well. Everyone can feel the pressure. Don’t be afraid to talk to someone about your exam, or about stress. Take a night for yourself, go bowling or watch a movie. While exams are important, so are you.